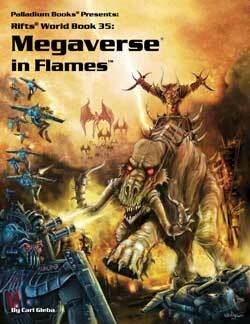 We are beyond insanely busy as we prep for Gen Con and try to get Megaverse® in Flames™ and The Rifter® #67 to the printer, along with the surprise title, Future Visions: The Artistry of Charles Walton II. All three need to be to the printer by Monday or Tuesday. Actually, it seems like everything is due this week and next week. Crazy. We've got a ton to do, so let’s get right to it. 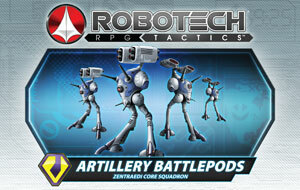 The first container of Robotech® RPG Tactics™ product is on the boat and headed for American shores. If all goes smoothly, it should arrive at the Palladium warehouse around August 8th. As soon as it arrives, we start assembling Kickstarter orders, packing and shipping. Please note that the few hundred copies we are bringing to Gen Con will not affect the shipping to our Kickstarter backers as we can only prep, package and ship so quickly. 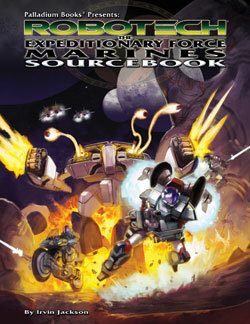 One sample of the finished Robotech® RPG Tactics™ game and a few of the expansion packs arrived today. They look beautiful. Freelancer Ben Rodriguez was here working and he went wild over them. We did too. Even though we have been working on every aspect for more than a year now, it is a rush to hold the actual, finished product in our hands. I think you’ll be very pleased with the final product. I know we are. Again, I want to apologize for any frustration and rancor our plan to sell a few hundred copies of the Robotech® RPG Tactics™ main game and some of the expansion packs at Gen Con Indy may have caused. As I’m sure you have already heard, I was so concerned about it that I decided to put the matter to a vote amongst our Robotech® RPG Tactics™ Kickstarter backers. I’m asking them to give us permission to take the items to Gen Con. This is open to Kickstarter backers only. We hope the majority answer “yes,” because Gen Con Indy is critical to a successful product launch in the Fall. That said, we are prepared to live by the outcome of the vote. I want to express my heartfelt thanks to everyone who has already cast a vote, whether it is “yes” or “no.” We appreciate your time and feedback. It is very important for us to get your permission and know what you think. You can get all the details in Robotech® RPG Tactics™ Kickstarter Update #149 and insights about the way I approached it in my Murmur of July 13, 2014. As I have said, all we have ever wanted is to create a great Robotech® battle game and figures that Robotech fans like ourselves would love. 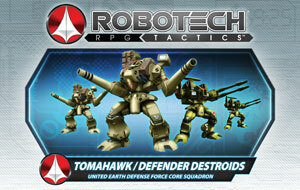 I think you’ll find Robotech® RPG Tactics™ to be that product. It is an honor and a privilege for us to be in a position to bring you that game line. And we have plans for much more. Getting this game into your hands has been a challenge. We are almost there. Thank you, so very much to our Kickstarter supporters and all our dedicated fans. 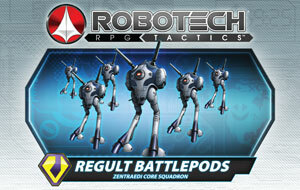 We anticipate Robotech® RPG Tactics™ to start hitting store shelves the end of September or beginning of October (tentative). We need to ship out to our Kickstarter backers first. Hey, Robotech fans, here is a Kickstarter that you will want to check out and take advantage of. Harmony Gold USA, Inc. has been quietly developing a new Robotech animated series. It is my understanding that concept work, a script, model sheets, new mecha designs and more are already done. Now they are looking to get the production of the pilot financed, at least in part, by Kickstarter. As a licensee of Harmony Gold, I like what I’m hearing about this new series. 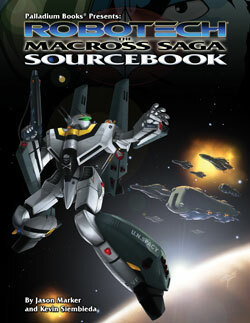 It takes place in space during the time period between Robotech®: The Macross® Saga and New Generation as the United Earth Expeditionary Force takes the fight to the Robotech® Masters and Invid. Hence the Sentinels connection (see below). Personally, I’m excited to see what new mecha, characters and stories come out of this new series, and I hope it will give us more material for Palladium’s Robotech® RPG games in the near future. TAKE NOTE: The current “steal” of the Robotech® Academy Kickstarter, especially for true Robotech® collectors, is the Lieutenant Colonel Tier. Here’s why. You get an original, one-of-a-kind, Robotech® The Sentinels animation cel!! Sentinels cels are hard to find and typically sell for $250-$500 all by themselves. I know, because I bought a couple dozen through Carl Macek when they were first offered in the 1990s, and over the years, I have sold many in that price range. Plus, I think animation art is sure to increase in value over the next decade as people realize they are increasingly rare treasures. The Lieutenant Colonel Tier costs $250 – but the cel alone may be worth that or more all by itself. Nice. PLUS you get all kinds of other cool stuff for your $250 pledge, making it the “steal” of this Kickstarter. I’m considering getting one myself. Note: There are a total of only 150 available so I recommend you snap them up fast, before other people realize what a great deal this is. Of course, there are other items too. Everything from soundtracks and art prints to coffee mugs and sweatshirts that are fun too. Almost done. Almost done! Wayne will be starting layout this weekend as I finish the writing tweaks to the last three sections. Meanwhile, the guys are proofreading and editing as fast as I’m peeling pages off. This book is fantastic. Check out the new description in this Update. It goes to the printer no later than Tuesday. Ships before we leave for Gen Con; probably around August 7th. If you haven’t gotten your orders in, NOW is the time to do it. This bad boy is in final production. Goes to the printer next week. More Rifts®, Splicers® and HU2 material. See the description later in this Update. Please note The Rifter® #67 will ship beginning of August. 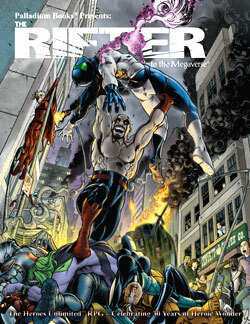 The Rifter® #66 is almost sold out. Get ‘em while you can. Future Visions is a 96 page extravaganza of black and white art for the upcoming Splicers® titles and a couple other Palladium projects. People love Chuck Walton’s artwork so much, we thought it would be fun to release a book that, a) showcases his artwork, and b) presents you a “visual showcase” for upcoming Palladium titles. Some is finished art. Some is concept art. All of it rocks. This is the kind of stuff that transpires behind the scenes. The price for this 96 page book is a deal at $13.95, and you’ll be able to get Chuck to sign it for you at Gen Con Indy. August release. See the description later in this Update. More and even cooler surprises to follow. Fall release. Sorry, with all the demands on us, we just couldn't get it done. Now shooting for a September/October release. See the description later in this Update. Fall release. Sorry, same story. With all the demands on us, we just couldn't get it done as a Summer release (we really wanted it for Gen Con). Now shooting for an October release. See the description later in this Update. Gen Con Indy is promising to be pretty awesome for Palladium fans. We won’t have as many new book releases as we had anticipated, but we will have Rifts® Megaverse® in Flames™, The Rifter® #67, Future Visions, Northern Gun™ 1 & 2, and most of our back stock titles, plus original artwork for sale, some specialty items, some out of print titles, and if our Robotech® RPG Tactics™ backers vote yes, we will have a few hundred copies of the Robotech® RPG Tactics™ box game, four of the expansion packs (Tomahawk/Defender Destroids, Regult Battlepods, Artillery Battlepods, and Glaug Command), and the rule book (comes in the box game but we’ll have loose copies as well). First come, first served. As always, we can only bring a limited number of products to sell. ALL items are sold on a first come, first served basis, while supplies last! 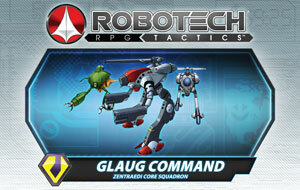 Robotech® RPG Tactics™ in particular. We always try to bring enough of everything to last the entire weekend, but it is impossible to predict. Inevitably, we run out of a handful of titles every Gen Con. And we have no idea of what the demand will be like for Robotech® RPG Tactics™ (provided our Kickstarter backers vote to give us permission to bring the items I’ve listed above). 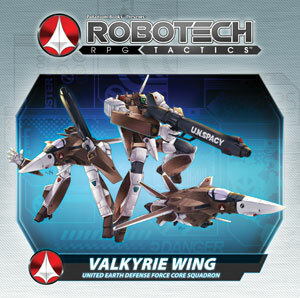 There will only be enough Robotech® RPG Tactics™ products to preview and give a few hundred lucky Gen Con attendees a taste of what they can expect in the Fall when the game and Wave One products hit store shelves. Meet and game with Carmen Bellaire, co-author of the Robotech® RPG Tactics™ rules. 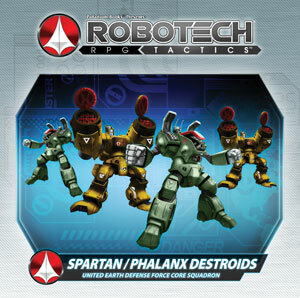 Carmen will be running demos of Robotech® RPG Tactics™ at the Palladium booth all Gen Con. Carmen will also have his crew demonstrating his new miniature board game Deus Machina, a gladiatorial robot game set in a Roman-like future. “Robots smashing the crap out of each other,” said Carmen with a grin. It features cards and miniatures. Deus Machina is not a Palladium product. Carmen is also the author of the Splicers® RPG and many other Palladium titles. 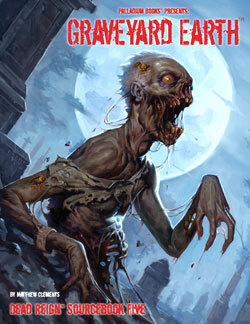 Role-playing game products galore: Rifts®, Robotech®, Splicers®, Palladium Fantasy®, Heroes Unlimited™, Nightbane®, Dead Reign™, Beyond the Supernatural™, Ninjas and Superspies™, After the Bomb® and all the rest. Plus special edition books, gold editions, prints and original artwork. I wanted to repeat this from last week. A number of you have reached out asking that we at least list prices so you can start planning the expenses for your trip to the Open House next year. My apologies for not getting up the full description and pricing weeks ago. We are buried. For now, here are some details and info. This is just for your information. You can not yet place your orders. But soon. VIP Thursday (this is an ADDITIONAL cost) – $87 – if you are planning to attend the rest of the weekend you’ll need to get a weekend admission as well. VIP Thursday is limited to 120 people plus the Palladium Staff and Freelancers. You get the delicious meal catered by Palladium’s very own Kathy Simmons (people rave about her meal), plus you get an extra afternoon and evening of gaming (opens late afternoon), a more intimate chance to talk with Palladium staff, artists and writers, and first crack at rare collectibles, prints and original art. 30+ Palladium creators. In the past, the POH usually has 30+ creators (writers, artists, editors, staff, Rifter contributors, etc.) attending. More than at any other convention or gathering anywhere, ever! And most are available to you almost the ENTIRE event to chat with you and sign autographs. Some will even run gaming events! 90+ gaming events. Game Masters/Megaversal Ambassadors NEEDED! Many games run by the people who make them, including Kevin Siembieda, Julius Rosenstein, Carmen Bellaire, Brandon Aten, Taylor White and many others! More panel talks than ever! That’s all this time around. Stay frosty and game on! Lord Kreelo and Megaversal Armaments. 192 pages – $24.95 retail – Cat. No. 876. Ships August 7, 2014. 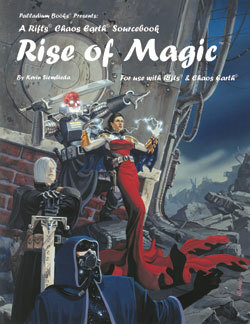 The Rifter® #67 is about adventure and monsters. Plus news, coming attractions, and more. Heroes Unlimited™ – Power Behind the Throne – by Alex Tullock. Get a glimpse at some of the true powers pulling the strings of governments and their superhumans. Spice up your Heroes Unlimited™ campaign with some political, spy and espionage elements along with supermen. Plenty of ideas for adventures, and includes NPCs and Hook, Line and Sinker adventure ideas. 96 pages – $13.95 retail – Cat. No. 167. Ships around August 7. We call it Future Visions because it very much gives you a glimpse into the future of what is coming from Palladium Books. It is jam-packed with black and white artwork and concept art for several of the upcoming Splicers® sourcebooks and a couple other Palladium projects. Things we are excited about and want you to be too. People can’t seem to get enough of Chuck Walton artwork, so here is an entire 96 page book filled with it. Some of the art is finished pieces, many others are concept art that may be tweaked and altered, or not used at all. Much of it is material you would never ordinarily see. If you like this book and it sells well, it can be the first of several Charles Walton II art books (and other artists?). We hope you enjoy it. It was a fun, quick and easy project to throw together. It didn't impact our schedule more than a few days. 96 pages – $13.95 retail – Cat. No. 2562 – Ships early August. Rescheduled for a summer release.